The ship, known as Roskilde 6, was excavated from the banks of Roskilde fjord in Denmark during the course of work undertaken to develop the Roskilde Viking Ship Museum in 1997. Since the excavation, the timbers have been painstakingly conserved and analysed by the National Museum of Denmark. The surviving timbers – approximately 20% of the original ship – have now been re-assembled for display in a specially made stainless steel frame that reconstructs the full size and shape of the original ship. The construction of the ship has been dated to around AD 1025, the high point of the Viking Age when England, Denmark, Norway and possibly parts of Sweden were united under the rule of Cnut the Great. The size of the ship and the amount of resources required to build it suggest that it was almost certainly a royal warship, possibly connected with the wars fought by Cnut to assert his authority over this short-lived North Sea Empire. 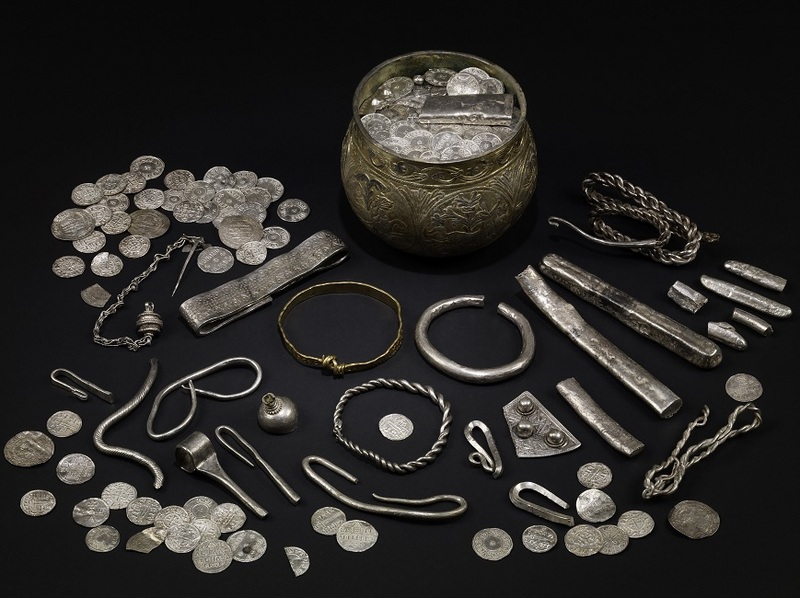 The Vale of York hoard, AD 900s. North Yorkshire, England. Silver-gilt, gold, silver. The Longship (Roskilde 6). The largest Viking ship ever discovered. The thirty-seven meter long warship was built in southern Norway around 1025, and deliberately sunk in Denmark in the mid-11th century. Copyright of the National Museum of Denmark.